The time has come for us and many other folks to say farewell to a historical landmark. 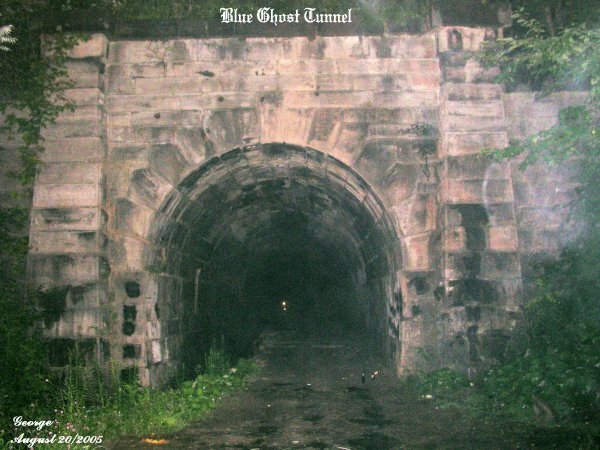 It had a place in history and housed a lot for folks to come and see.The Blue Ghost Tunnel was named after a young fellow named Russ had gotten images of blue ecto plasm at the tunnel and displayed them on his website. Russ had encountered many strange things at the tunnel and he had posted his findings of the tunnel up on the internet. It was through this young man's web site that we found the tunnel back in 2002. 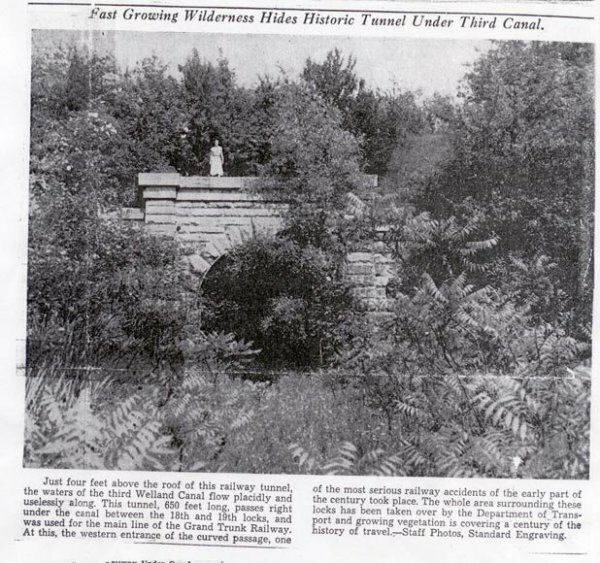 The real true name of the tunnel was the old Merriton Tunnel that was built by the Grand Trunk Railway Company. As reported by the local papers in the past couple of weeks about sealing off the tunnel, it housed a lot for the paranormal investigator. It is unfortunate some folks that visited the tunnel did not go there for its vast history or to go and admire the craftsmanship of the tunnel. They went there to party. Drinking, taking drugs, and spray painting the walls and trashing the place by setting fires on the old board walk that used to hold the old rails that went through the tunnel, as well as having campfires just outside of the tunnel and leaving trash after they had their parties. We have had many experiences at the tunnel ourselves and we had conducted the history to the tunnel and posted our findings up on our web site, complete with pictures and our experiences there.We also had a map with directions on how to get to the tunnel for those interested in checking the place out to conduct their own paranormal investigations.Over time the tunnel had more visitors come and see if, in fact, the tunnel was haunted. Many other web sites had directions to the tunnel and some took them down after hearing stories of the place being trashed with garbage. Then Creepy Canada had a show that was helped by "another Hamilton group", complete with camera crew and psychics that went to explore the Blue Ghost Tunnel. It is true that the group that helped Creepy Canada did say not to disclose the location of the tunnel from our understanding. To our knowledge Creepy Canada never did give the location, outside of saying that it was located in St. Cathrines, Ontario. 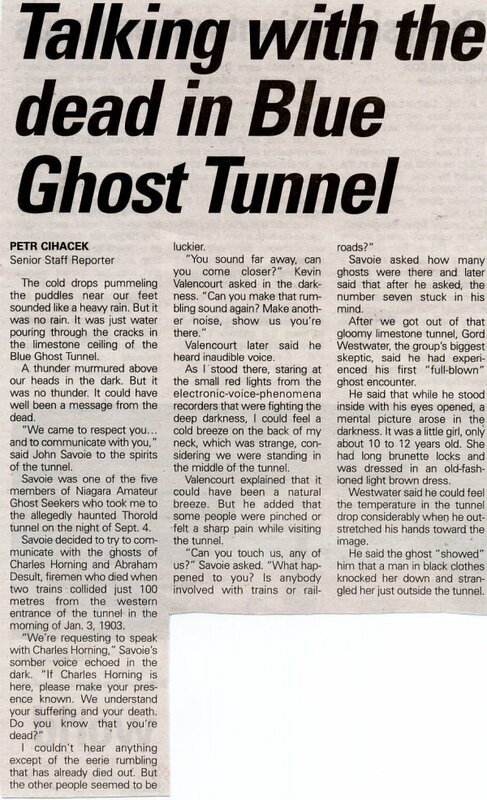 After the airing of the Blue Ghost Tunnel episode, many folks got on the net to look the place up and of course the more times it was aired on TV the area became more popular. The folks responsible for helping Creepy Canada with the show said they had "washed their hands of it" after hearing stories and seeing postings on their site that the place was being trashed. The airing of the TV show did play a large part in more people finding out about the tunnel. Today the Seaway is very concerned for the peoples safety and now have started construction of a cinder block wall to seal up the tunnel. The first news article shown here, was sent to us by Kevin from N.A.G.S. ( http://www.nagscanada.com ) the second news article printed out below was sent in by Rick. Even the fierce glare of the afternoon sun can’t banish the creepy chill lurking in the Blue Ghost Tunnel. The former railway tunnel, curving into darkness under the third Welland Canal, boasts a slew of haunted hallmarks. A historic train wreck complete with nasty fatalities, of course. Submerged graveyards just around the corner. A deliciously isolated location. It even looks like a Hollywood horror director’s fondest nightmare. The yawning black hole into history is tucked away under a seldom-used dirt track, slowly losing a battle to encroaching plant life. Crows get in on the act, crouching ominously in a couple of stark-limbed dead trees nearby. You have to be a brave, chill-seeking soul to venture into the gaping mouth of the tunnel and not just because of its ghoulish reputation. The ghosts may not mind a visit, but the St. Lawrence Seaway wants you to stay as far away as possible. “It’s not safe,” says an emphatic Michel Drolet, Niagara region vice-president of the St. Lawrence Seaway Management Corp. The tunnel and a few thousand acres of land around the old canal are owned by the federal government and managed by the Seaway. For safety reasons, the Seaway has asked The Standard not to identify exactly where the tunnel is located. But Drolet says he realizes many locals already use the surrounding land as an unofficial park for dog-walking, cycling and dirt-bike riding. Strolling along the dirt road in the sunshine isn’t a big issue for the corporation, says Drolet even if it is trespassing. But in recent years, the site has proved a different sort of nightmare for Seaway employees, who find teens partying near the tunnel, especially around Halloween. Interest in the tunnel spiked after the CTV documentary program Creepy Canada ran a segment on the topic. To discourage visitors, the Seaway fenced off the entrances to the tunnel, only to have them pulled down by irate trespassers. 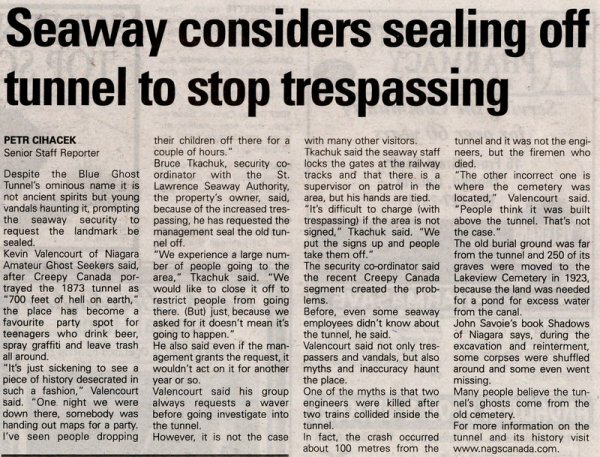 Now, the Seaway is considering walling off the entrance with cement blocks effectively burying the tunnel’s history and paranormal denizens forever. It does require a tricky climb, down a muddy, near vertical slope to find the western mouth of the tunnel, originally used by the Grand Trunk Railway between 1882 and 1915. At 77, Ray Wilson has managed that climb dozens of times. Wilson, a Niagara Falls resident who grew up in Thorold, isn’t afraid of the climb or the ghosts. “Oh no, no, I don’t believe in the supernatural,” he says with a laugh. Despite “roving all over Thorold” in his youth, Wilson only discovered the historic tunnel five years ago. He’s dedicated countless hours to researching its history ever since. “It’s just such a fascinating part of our heritage,” he says, waving his walking stick expressively at the stained limestone block walls. The 214-metre tunnel was originally meant to provide a rail route under the third canal. The single-track tunnel was soon replaced by a swing bridge but not before it stood silent witness to a massive train collision a hundred metres from the western entrance. 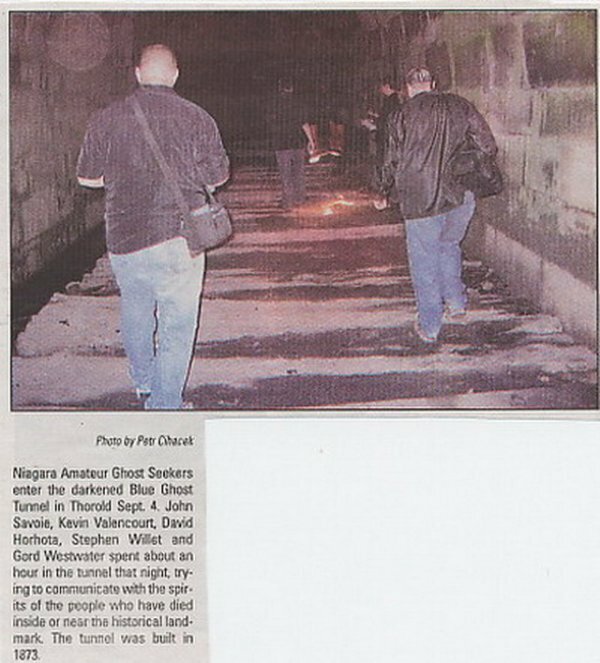 Two firemen aboard the train died in the 1903 collision, giving later-century spirit hunters like the Niagara Amateur Ghost Seekers an excuse to explore. 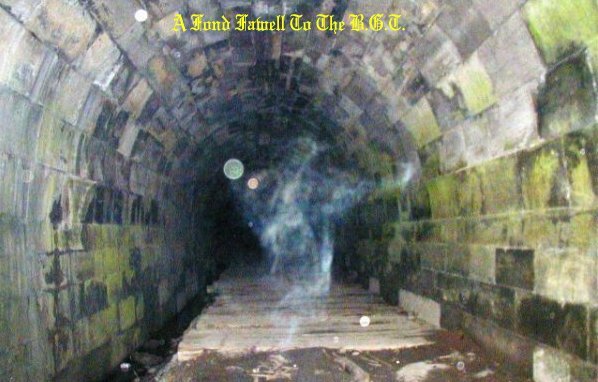 The tunnel is a popular paranormal web attraction, with posted pictures of wispy “ectoplasm” and blue orbs that apparently gave the tunnel its name. To Wilson, however, the tunnel isn’t dark and forbidding. It’s a shining example of our industrial history. And it would be a shame, he says, if it was hidden behind a wall. “I would be upset, if it happened,” he says. “I understand why the Seaway would be apprehensive. The problem these days is that ‘sue everyone’ mentality. Municipal officials like the idea even if it seems a longshot. St. Catharines Regional Councillor Bruce Timms is championing the idea of a federal historical designation for all the old canal lands in Niagara. “Saving structures like the Blue Ghost Tunnel is exactly the type of goal we would have with a designation,” says Timms. Convincing a federal agency like Parks Canada to take over responsibility for the canal lands would be an ideal solution but also a major undertaking, admits Timms. Timms says Niagara regional council is researching the feasibility of pitching a park to Ottawa, but a detailed report is still months away. Wilson has also approached the St. Catharines Museum about the idea of creating an exhibit on the tunnel and maybe pushing the park idea as well. It’s a tempting notion, says Kim Payne, tourism development officer for the City of St. Catharines. Payne says the wooded area along the old canal “is obviously well-used,” noting visitors to the museum often ask for directions to see the tunnel. “It’s private property, but it would be a pity to lock it away,” he says. He says he hasn’t talked to the Seaway about the tunnel yet, but plans to “make some inquiries” in the near future. The bottom line, however, is the Seaway doesn’t want to remain liable for any future public use of the property. Although the block limestone tunnel looks solid, Drolet says it leaks heavily and Seaway engineers have declared it unsafe. That’s enough to worry the corporation, which has recently been named in three separate lawsuits by individuals who claim to have hurt themselves on Seaway property. “I think the Seaway has been a good corporate citizen. We recognize the historical value of (the old canals),” he says. We are saddened by the idea of the BGT being sealed forever, and it is a shame to hide a piece of history. But we can understand why the Seaway came up with the idea of closing off the tunnel. As indicated in the news paper articles above it can be a safety concern. With the month of October and Halloween coming up, we are sure the tunnel will be sealed by October 7th, 2005. A lot of folks had a chance to see the tunnel in its glory as it stands today. The only reminders we will ever have of the BGT are the pictures we have up on our web site. And we hope, for those that never got a chance to see the tunnel in real time, enjoy their visit to our site and admire the pictures we had taken of this one piece of history that will be hidden away forever. 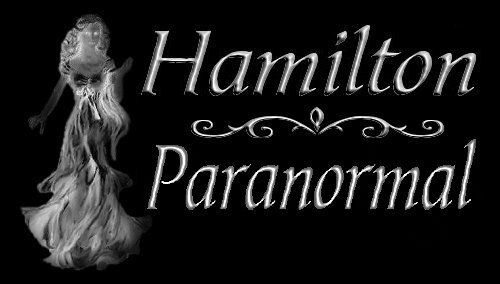 We say Goodbye to the Blue Ghost Tunnel and thank many of the folks we had met there for being a friend to us here at Hamilton Paranormal.